The Himalayan woodpecker (Dendrocopos himalayensis) belongs to the family of wrynecks and woodpeckers, the Picidae. The Himalayan woodpecker species is distributed in Afghanistan, Pakistan, India and Nepal. These woodpecker species inhabit boreal and temperate forests in the Himalayan Ranges and neighboring areas. These woodpeckers are polytypic species. The Himalayan woodpecker (Dendrocopos himalayensis) is a medium-sized pied woodpecker, measuring 20 to 25 cm in length and weighing 60 to 85 grams. The Himalayan woodpecker has black upperparts with broad white patches from shoulder to the lower back. The head is pale buff with black "Y" shaped marks on neck and cheeks. The crown is red in males and black in females. The flight feathers have limited white barring. The underparts are dirty white. The outer edge of the outer tail feather is white. The vent region is pinkish red. The juveniles have duller plumage. The bill is strong, straight and steel gray in color. The irises are dark brown. There are distinct black markings under the eyes. The legs are gray. The call of these woodpecker species is a single "kit" sound. These Himalayan woodpeckers are distributed in the Himalayan Ranges in Afghanistan, Pakistan, India and Nepal. In India, they are distributed in the states of Jammu and Kashmir, Himachal Pradesh and Uttarakhand. The Himalayan woodpecker nominate subspecies D. h. himalayensis is distributed in eastern Himachal Pradesh (India), Uttarakhand (India) and western Nepal. The subspecies D. h. albescens is distributed in northeast Afghanistan, north Pakistan and northwest India (Jammu and Kashmir and west Himachal Pradesh). The Important Bird and Biodiversity Areas (IBA) of these woodpecker species in Afghanistan are, Pech and Waygal valleys and Safed Koh. The IBA of these species in Nepal are, Shey-Phoksundo National Park, Rara National Park, Khaptad National Park, Kanchenjungha Conservation Area and Dhorpatan Hunting Reserve. 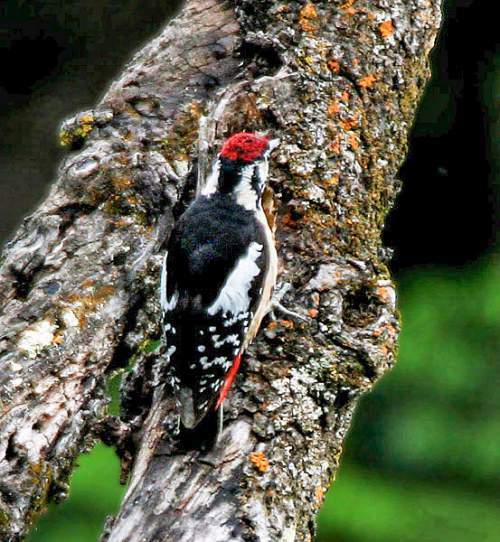 These Himalayan woodpecker species have high forest dependence. They normally occur in altitudes from 1500 to 3200 meters. The natural ecosystems and habitats of these woodpecker species include tropical and subtropical dry forests, tropical and subtropical moist montane forests, coniferous forests and high altitude forests. The diet of these species consists mainly of insects. Insects, insect larvae, wood-boring beetles, wood-boring beetle larvae, weevils, fruits, seeds, pine seeds extracted from cones and plant sap are their primary food. The breeding season of these Himalayan woodpeckers is during April and May in most of their range. These species are monogamous. There is aerial courtship display. They nest in self-made holes in the tree trunk. The breeding pair excavate the nest hole, the major part of excavation being carried out by the male. The clutch may contain three to five white eggs. These Himalayan woodpecker species are non-migratory resident birds. They disperse locally after breeding. The populations in higher altitudes descent to lower levels during winter. The global population size of the Himalayan woodpecker (Dendrocopos himalayensis) has not been quantified. The overall population trend of the species is considered to be stable. In most of its range, this species is reported to be common to fairly common. The generation length is 5.2 years. Its distribution size is about 314,000 sq.km. 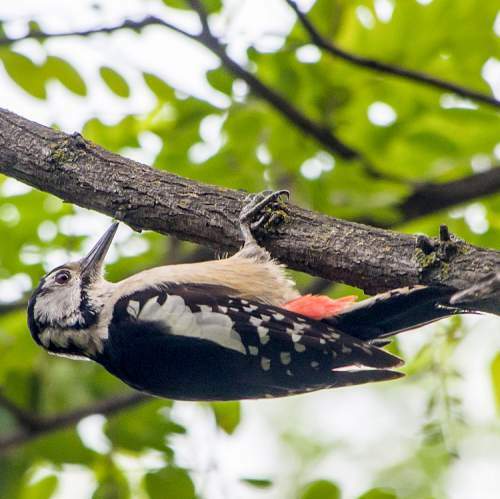 Habitat alteration and destruction, deforestation and human intrusions and disturbance are the main threats that are endangering the survival of these woodpecker species. The Himalayan woodpecker (Dendrocopos himalayensis) does not approach the thresholds for being Vulnerable, either under the range size criterion, or under the population trend criterion or under the population size criterion. The CITES (Convention on International Trade in Endangered Species of Wild Fauna and Flora) status is ‘Not Evaluated’ for the Himalayan woodpecker (Dendrocopos himalayensis). 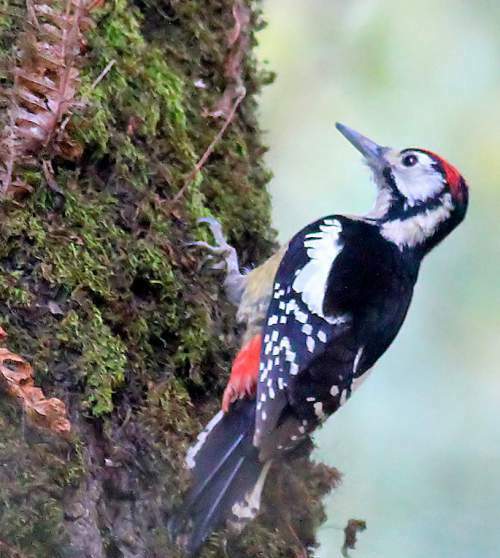 The Himalayan woodpecker (Dendrocopos himalayensis) is closely related to the great spotted woodpecker (Dendrocopos major), Sind woodpecker (Dendrocopos assimilis), Syrian woodpecker (Dendrocopos syriacus) and white-winged woodpecker (Dendrocopos leucopterus). The two recognized subspecies of the Himalayan woodpecker (Dendrocopos himalayensis) are: Dendrocopos himalayensis himalayensis (Jardine & Selby, 1835) and Dendrocopos himalayensis albescens (E. C. S. Baker, 1926). Current topic in Birds of India: Himalayan woodpecker - Dendrocopos himalayensis.